Lapis Lazuli jewelry is what you wear when you want to feel classic with a twist. The deep blue color of this semi-precious stone gives vintage and feminine vibes. The gold and sometimes white specks in lapis balance out the vintage look which makes the piece more modern and playful. The best of both style worlds. If you are looking to buy semi-precious stones jewelry, look out for lapis lazuli. Learn what you need to look for by reading this guide on how to buy lapis lazuli jewelry. Lapis lazuli is basically the galaxy captured inside a rock. It is a semi-precious stone with ethereal colors of deep blue, gold and sometimes white. These three different colors can be found in the same stone because lapis lazuli consists mainly of three different minerals. These minerals are lazurite which is blue, pyrite which is gold or silver and calcite which has a white coloring. Lapis, for short, is not as hard as other precious stones like rubies. This is why jewelers prefer to shape the stone into simpler forms like ovals, beads or circles. This shows off the shimmer of the lapis with less chance of chipping. How Should the Coloring Be? Since lapis lazuli consists of different minerals, the coloring of each rock is unique. The deep blue is characteristic of lapis which is also the color most sought after in lapis lazuli jewelry. However, the blue hue is part of the spectrum of lapis lazuli. The spectrum goes from a light purple to a very dark blue but lapis can also be greenish. Green lapis indicates that pyrite is very prominent. A deep blue with a pretty pattern of gold specks is also popular for lapis lazuli jewelry. Lapis with visible white, on the other hand, is less sought after. This is because calcite, which is a grayish white, is actually the host stone of lapis lazuli. This means that the lapis is found in larger pieces of calcite. Less calcite suggests that the lapis is more pure. Where Is Lapis Lazuli Sourced From? For centuries, lapis lazuli was mined from the mountainous regions of Afghanistan. Even today, Afghanistan is still the main source of lapis. More recently, lapis lazuli has also been found in Chile, Pakistan and Russia. There are also a few North American sources namely Colorado, California and Canada. Persian or Afghan, Chilean and Siberian or Russian describe the color of lapis lazuli jewelry. Don’t let this terminology fool you. These terms do not actually refer to the source of the mineral. It is merely used as jargon for certain color patterns. Persian or Afghan lapis is the most valuable. This is because it refers to lapis with a vibrant blue color. The blue tint is even throughout the piece. In Persian lapis there is no visible calcite and only very little visible pyrite in the form of silver or gold specks. Chilean lapis has more prominent levels of pyrite and calcite. The blue is less prominent in this type and the stone can even be greenish. White streaks from the calcite and pyrite are visibly present. This is the least valuable kind for lapis lazuli jewelry. The value of Siberian or Russian lapis ranges between the Chilean and Persian lapis. The blue color is not even in the stone. There might be darker and lighter shades of blue. Also, pyrite or calcite is present and visible. Which jewelry design to go for is up to your personal style. Here are a few tips for lapis lazuli jewelry that will bring out the stone’s qualities the best. Lapis is usually cut into round smooth surfaces like beads, ovals, circles and cabochons. These shapes showcase the different coloring in lapis. Sharp faceted lapis is rare. To truly show variation in lapis lazuli shades, wear a beaded bracelet of only lapis. Each bead differs in color which basically makes this a style hack for the trend of mixing gemstones. Lapis that is a deep blue with gold specks is more vibrant in cool colored metals like silver, white gold and platinum. If you like lapis lazuli jewelry that has visible calcite then the white will also be clearer against a cooler metal. 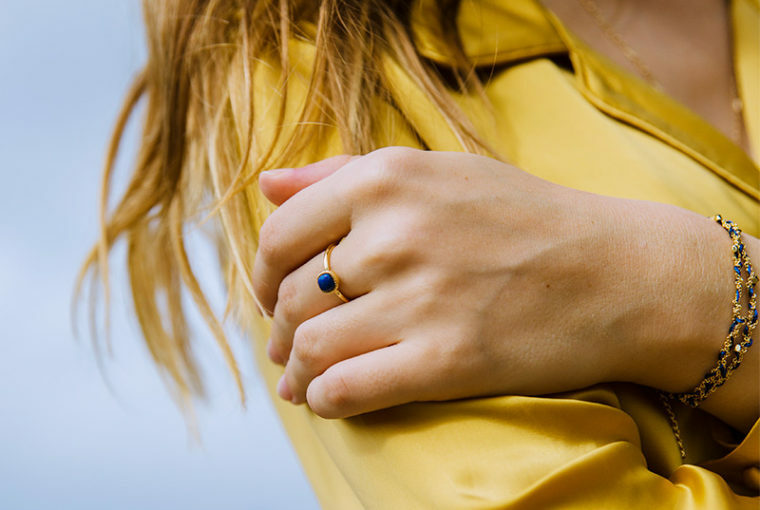 For a more vintage feel we recommend lapis set in yellow gold pieces. A gold pendant necklace or oval shaped ring are both classic pieces. That’s our list of shopping tips for lapis lazuli jewelry. Though the darker blue lapis pieces are more valuable, don’t let that be your only choice. Choose the color pattern that speaks out to you. Read on for more on lapis and other gemstone jewelry information. 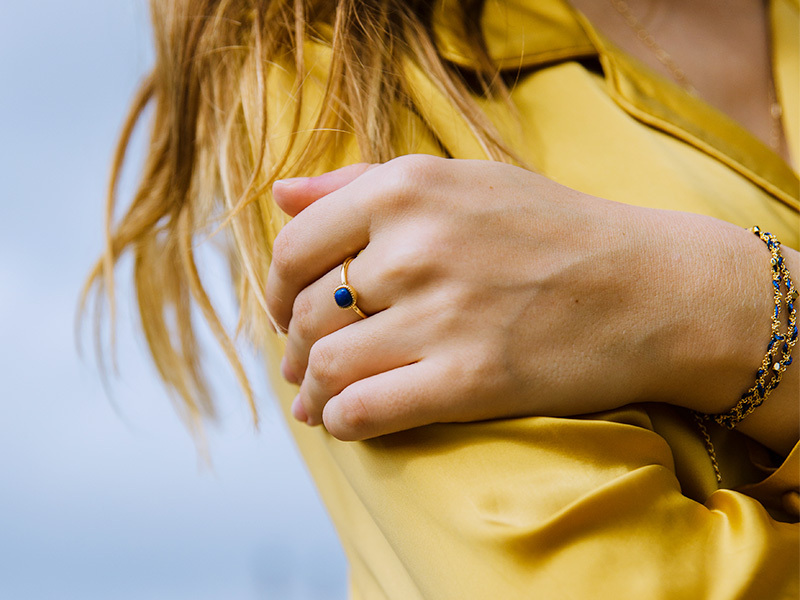 Check out Ana Luisa’s lapis lazuli rings to get a truly unique jewelry piece that you will want to wear every single day.